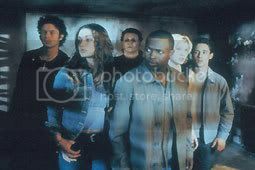 Halloween: Resurrection is a 2002 horror film and the eighth installment in the Halloween film series. Directed by Rick Rosenthal, who had also directed Halloween II, the film builds upon the continuity of Halloween H20: 20 Years Later. Just like its former installment, Resurrection effectively ignores the story lines established during the fourth, fifth, and sixth installments. Halloween III: Season of the Witch, which does not include Michael Myers as a character (and in fact was purposefully made as a separate film with no connection to the first two), is not considered to be a part of the "Halloween" storyline. Three years after the events that happened in California, Laurie Strode (Jamie Lee Curtis) has been sent to a psychiatric hospital after it is revealed that she had beheaded a paramedic instead of Michael; the paramedic had located the body of Myers in the dining hall of Laurie's school, but Myers had attacked the paramedic, crushed his larynx, and forcefully switched clothing and his mask. On October 31, 2001, still in captivity, Laurie pretends to be heavily medicated, behaving as though she had extreme dissociative disorder. In fact, she hides her pills and prepares herself for the inevitable confrontation with Michael. 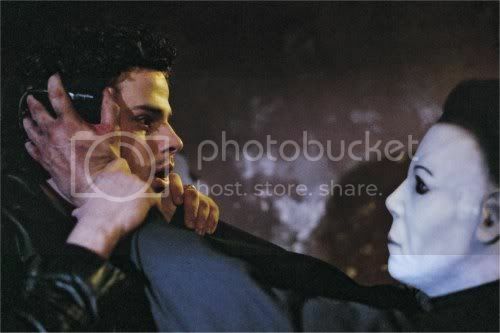 When Michael finally appears, Laurie lures him into a trap, as she attempts to kill Myers, she second guesses herself, to make sure that it is really her brother this time when it's obvious. 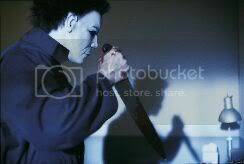 Myers takes advantage, and stabs her on the roof. She then kisses him then says " I'll see you in hell". Then falls to her death. Michael then returns home to stay. His mission is complete. The following year on Halloween Eve, six college students - Bill Woodlake (Thomas Ian Nicholas), Donna Chang (Daisy McCrackin), Jen Danzing (Katee Sackhoff), Jim Morgan (Luke Kirby), Rudy Grimes (Sean Patrick Thomas), and Sara Moyer (Bianca Kajlich) - win a competition to appear on an Internet reality show directed by Freddie Harris (Busta Rhymes) and his assistant, Nora Winston (Tyra Banks), in which they have to spend a night in the childhood home of Michael Myers. Their mission is to find out what led him to kill. 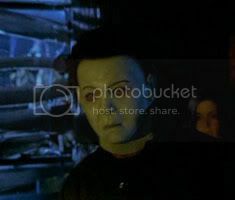 On Halloween day, they start to search the entire house for something that can lead to Michael's past, and decide to separate into three groups to cover more areas. The event goes horribly wrong as Michael returns home, and one by one he kills the students and the crew. The last student, Sara, is chased by Michael and bumps into Freddie. The two fight against Michael, but Freddie is hurt and Sara flees. In the climax of the film, Sara gets trapped in the garage of the house and faces Michael, but sets the garage on fire by mistake. As Michael is about to kill Sara, Freddie, wounded, arrives and electrifies Michael. Freddie rescues Sara as the emergency services personnel arrive. In the final scene of the movie, Michael's body is sent to the morgue. As the coroner opens the body bag, Michael's eyes suddenly open and a scream can be heard. The first ending shows the garage on fire with Michael entangled in the cords, apparently still alive. While still trapped, Sara looks around to see the garage on fire, only to be saved by her internet pen pal Myles, whom she does not know personally. Myles then picks her up and runs out of the garage, leaving Michael to burn to death. After being saved by a "stranger", she asks him who he is only to find out that he is in fact Deckard, her internet pen-pal. After the police arrive, Myles reveals who he really is to Sara. Freddie is brought to a waiting ambulance on a stretcher and apologizes to Sara once more to which she responds by kissing his forehead before he is taken away. 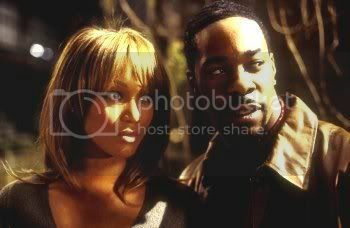 Myles then tells Sara she killed the Boogeyman to which she replies: "You can't kill the Boogeyman". The second ending takes place right after Freddie shoves away the camera man after being asked how he feels at that moment. While the fire department puts out the fire, which has consumed the garage, the CSI arrive at the scene to investigate. 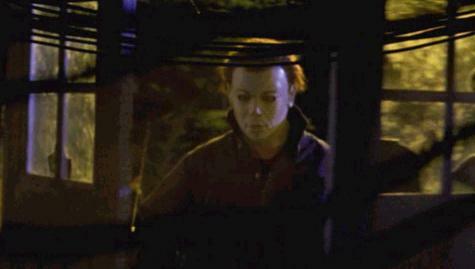 While investigating the hole in the back yard of the house, a female agent looks down the hole only to be grabbed by Michael, who somehow escaped the burning garage. The shot ends with the agent screaming when the screen turns black. The third ending shows Sara asking to see Michael's face, with Freddie coming to take a peek. When the body bag is opened, a cameraman sneaks a peek at Michael's dead body and the fireman pushes him away. After Freddie says a few words to a dead Michael, he is suddenly grabbed by the throat and almost choked. Sara then grabs an axe and hits Michael with it on the head, finally killing him. After being released from Michael's grip, Freddie looks at Sara, says a few words and also God Bless you. Then he gives her a smile and the scene ends. The alternate endings are included on the DVD.